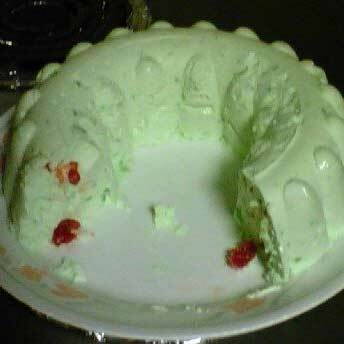 Pineapple-Lime Congealed Salad, or molded salad is a salad made with flavored gelatin, fruit, and sometimes grated carrots or more rarely, other vegetables. Other ingredients may include cottage cheese, cream cheese, marshmallows, nuts, or pretzels. These salads were popular in the 1960s. Dissove the gelatin in the boiling water and let stand until cool. Fold in the sour cream and pour into a lightly oiled mold or 9 by 13 inch pan. contains recipes from the islands of Curacao, Aruba, and Bonaire. Most of all the recipes on the site has been submitted by our visitors. You will have different variations of the same recipe. Please feel free to copy or download any recipes. Some recipe's description, information, and origin has been taken from the https://www.wikipedia.org/ website. Antillean Eats © 2016 - .